Both the keypad entry system and the RFID reader are connected to a relay that closes the circuit to whatever is attached. For example, it might be attached to an electronic door strike. But what if you wanted to integrate both systems so that you could unlock your door with either a secret code or RFID tag? It’s surprisingly easy to do! The diagram shows how you connect the two projects. You can see that the RFID reader is connected to the same power 5V power supply rail as the keypad and display components. The indicator LED and the relay from the breadboard for the RFID reader project have been removed. 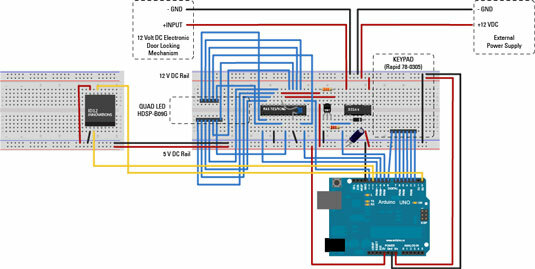 The only wiring you need to change is to connect the RFID reader’s reset pin to Arduino Digital Pin 12. You can’t connect it to Pin 13, because that pin is used by the LED Display IC of the keypad entry system. When you add your RFID reader to the keypad entry system, connect the ID Solutions RFID reader’s reset pin to Arduino Pin 12. Don’t forget to make sure the closing curly bracket is at the bottom of the loop() section. Copy the checkTag(), compareTag(), and resetReader() functions from the RFID reader code to the end of your new sketch. Don’t copy the lightLED() triggerRelay() functions, because they aren’t needed in the new code. Remember to create if. . .then. . .else tests for each of the RFID cards you want to use and to create variable for the tag ID number in the variable declaration section. You don’t need the last lines that print a tag number to the serial port, once you disconnect the project from your computer and install it into the enclosure, but it is handy while you are testing.